As mentioned in earlier posts, post shipment finance is given by bank to exporters on the basis of export bills on collection /discounting/negotiation. 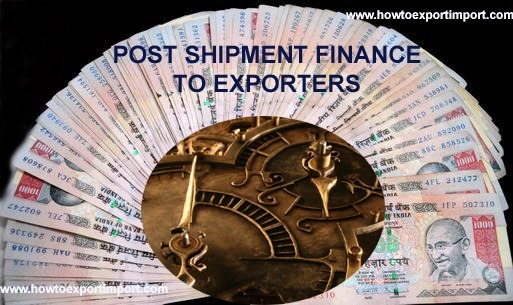 The post shipment finance is provided to exporters with low rate of interest. 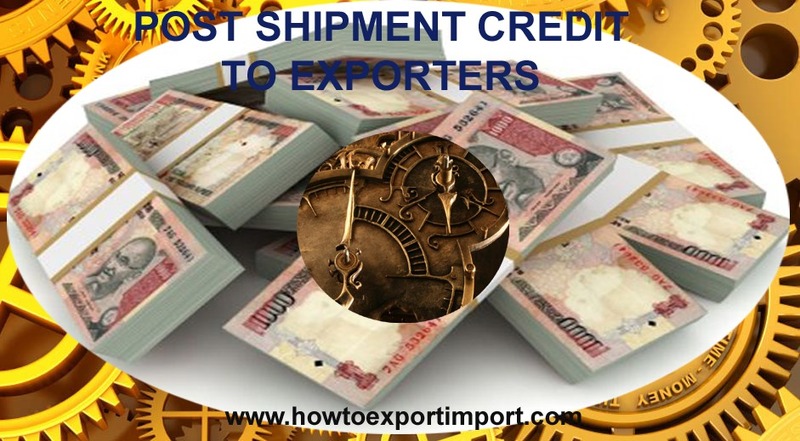 The amount of post shipment loan is liquidated by the payment of export bills received from overseas buyer in respect of invoice value of goods exported or services rendered by exporters. However in some cases, the post shipment credit is liquidated on mutual agreement between bank and exporter by repaying or prepaying out of EEFC account. EEFC account means Exchange Earners Foreign Currency Account. Although export post shipment loan is adjusted out of EEFC account, such exported bills adjusted continue to be followed up for realization of export amount and continue to be reported. The liability of exporter continues till overseas bill is realized against goods or services exported. The period of advance for demand bills is the average period of time normally involved from the date of purchase,discount or negotiation of bill till receipt of bill proceeds in the nastro account of the bank concerned, as prescribed by FEDAI time to time. Exporters may be noted, this period is not the period of time taken for the arrival of goods at destination of export consignment at foreign country. If usance export bills, the period of credit can be granted up to maximum of 365 days from the date of export shipment inclusive of normal transit period and grace period, if applicable. Although reserve bank fixed this period, banks should closely monitor the need for extending post-shipment credit up to the permissible period of 365 days and they should persuade the exporters to realize the export proceeds within a shorter period. As per bank, under a demand bill, if realization of export proceeds not effected after grace period granted later to normal transit period, such bills are treated as overdue bill. If export is on usance bill contract, the bank can treat those bill overdue, if export realization not happened on due date. As per my experience in import export trade, I personally feel, the above arrangements are not in order as most of usance bills may not be realized on exact due date, as it takes some time to credit to exporter’s bank account. For example, if an exporter contracts with his overseas buyer for 60 days usance bills, the amount might be realized say by 70th day at exporter’s bank. Here, the bank has option to crystalize the bill by charging commercial rate of interest. So, as per my personal opinion, bank can provide a lump sum amount of loan against export bills as a running account with a period of 1 year with lower rate of interest by clubbing post shipment and pre shipment. Related Read: How to get export order? Samir Banerjee: On 19 July 2014 We experience it is quite difficult to adjudge the freight charges quoted by freight forwarder is correct. There might be some hidden charges, which we are not aware-off. How it is possible to ascertain the quoted prices are genuine and competitive, secondly who decides the IHC, because we have experienced that IHC varies shipping line to shipping line. When the consignment moved from port of discharge to port of delivery by Rail, the freight charges should be decided by designated Rail Authority, the charges should be claimed by CONCOR on actual, what is the role of shipping line in this? Can we directly negotiate the rail freight with CONCOR ? Admin: On 19 July 2014 Hi Samir Manerjee, Quote on freight charges is the quote like any service quote. You need to study the price and service of freight forwarder. If you are a beginner, collect minimum 5 quotes from freight forwarders. If you are in to trade, you will learn with experience. Rail IHC can be cross verified with CONCOR , as concor has a standard rate. Rail freight is charged directly to whom the freight is booked. You can deal directly with concor, if you book directly with them. Howeever, I dont think its practical unless you have high volume of containers. Nilesh dubey: On 16 February 2015 i would like to know about the new firm of export import & some of the documentation which is require for export import. like ARE FORM, CT 1 FORM,& which document required for the new opening firm.